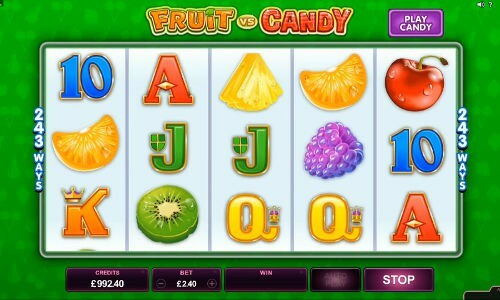 Fruit vs Candy Online Slot is a 5 reel, 243 payline video slot game powered by Microgaming. This slot can be played in two game modes, each with a unique Free Spins feature and a delectable symbol set. You can choose between Fruit or Candy at any time in base game, allowing you to easily choose your favourite side. Fruit vs Candy is packed full of surprises, including two exciting base game Bonuses and two ways to trigger Free Spins. For the Fruit fans, Free Spins offers the juicy Cash Stash feature, and the Candy crunchers can sate their cravings in Free Spins with Sweet Reels. Fruit vs Candy is the perfect video slot for new and experienced players and alike, offering a choice of two game modes and a full assortment of fun features. With colourful graphics and an exciting game engine, this Slot is all set to become a favourite.